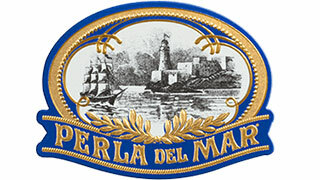 Perla Del Mar Cigars are an exclusive line brought back to life by Eric Newman, the president of the JC Newman Company. Eric has an insatiable appetite cigar history and art, he came across an old Cuban band with the Perla Del Mar name and decided to revive this forgotten Cuban cigar and update it. With seeds that have their roots in the rich fertile soil of Cuba, The Perla Del Mar (The Pearl of the Sea) is a testament to attention to detail in fine cigar making. Many years ago when Cuban exporters needed to get more cigars in each box, they started packing cigars tightly which altered a shape of the cigars. The dense packaging produced a more square shape which packs as much tobacco as the space will allow. This attribute is very rare and not commonly seen in most of the cigars on the market today. These box pressed cigars also burn longer and have a bolder taste than many “round” cigars. Perla Del Mar Cigars are artfully crafted at the Fabrica de Tabacos San Rafael SA factory in Esteli, Nicaragua; the same factory that produces highly rated Brick House, Diamond Crown, and El Baton Cigars. Each Perla del Mar features a silky Ecuadorian Connecticut wrapper that surrounds Nicaraguan filler and a binder from 4 distinct Nicaraguan regions – Pueblo Nuevo, La Reine, Condega, and Jalapa. The Perla Del Mar Cigar is a medium bodied, perfectly constructed stick with a cool draw, an ideal burn, and an ash that holds firmly. After torching the Perla Del Mar, you are welcomed into a cigar with flavor notes of creamy caramel, coffee beans, spice, a mix of citrus, and woodiness in the background. For those who enjoy the taste of fine Nicaraguan tobacco, the Perla Del Mar cigar will exceed your expectations, not just in taste, but in price as well. A box of 25 cigars comes packaged in a vintage dark cherry wooden box and are available in four sizes: The Perla M (Robusto), Perla G (Toro), Perla P (Rothschild), and Perla TG (Gordo). At only $4.44 a stick for this exceptional Nicaraguan masterpiece, you’ll be thinking this is the Perla de Humidor – the Pearl of your Humidor! BUY THE PERLA DEL MAR CIGARS AND TASTE THE REAL CIGAR TREASURE FROM JC NEWMAN!